I saw Captain Phillips the other night. Holy Moley – – that is one intense movie. If you remember the story – it is about a container ship that is captured by a gang of Somali pirates back in 2009. This movie has some of the best acting that I’ve ever seen from Tom Hanks. WOW – he is amazing. 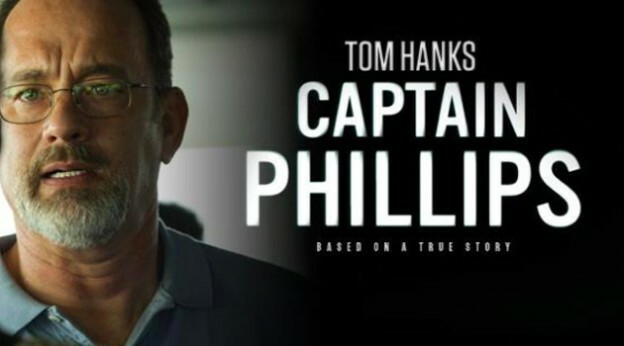 I almost forgot it was Tom Hanks I was watching and really believed he was Captain Phillips. The two most moving parts of the movie for me are when the pirates are storming the ship. The looks on Phillips’ (Hanks) face is perfect. It is 100% “Holy F! What is happening!! !” It makes one think – what would I do in this situation. Because really – these guys were just normal guys. They aren’t military guys. The only protection they have on the ship is high-powered water hoses to try to keep any intruders away. It works one day, alas the next day one becomes dislodged and gives an opening for the pirates to enter. The second most moving part of the movie was the final scene. My husband and I both agreed – this is probably the best acting Hanks has ever done. The final scene is Phillips being examined by a Navy Corpsman on board the USS Bainbridge, the ship that helped rescue Phillips. He is in shock and can’t speak, he has been beaten and is exhausted. And then it all starts to come to reality – the hell he just survived and what is all entailed. This movie had my stomach in knots and my heart racing. I was nervous and scared for Phillips and the crew of that ship. It’s not really a popcorn and candy sort of movie. I can totally see how this movie has been nominated for Best Picture. But how in the world was Hanks not nominated for Best Actor??? Barkhad Abdi absolutely deserves his nomination for Best Supporting Actor. Categories: Movies | Tags: Best Picture, Captain Phillips, movie reviews, Phillips, Tom Hanks, US Navy Seals | Permalink.